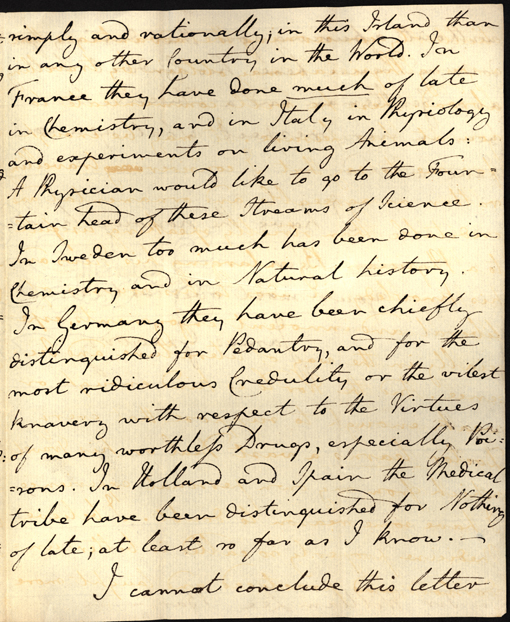 In the letter presented here we get James Gregory’s personal, not to say witty, opinion about the benefits to a young medical student of visiting other countries as well as his view on the state of science in different European countries. 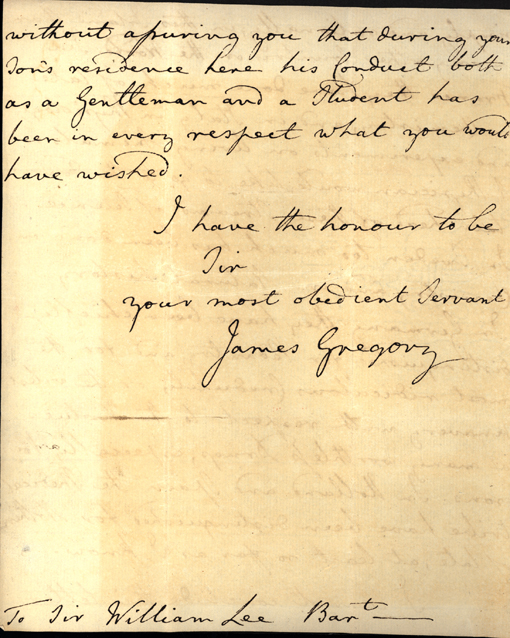 The letter is addressed to the Baronet Sir William Lee, to whose son James Gregory was apparently some kind of tutor. I fear you must long ere now have thought me guilty of great rudeness or negligence in not sooner acknowledging the honour of your Letter which I received in Jan’y. 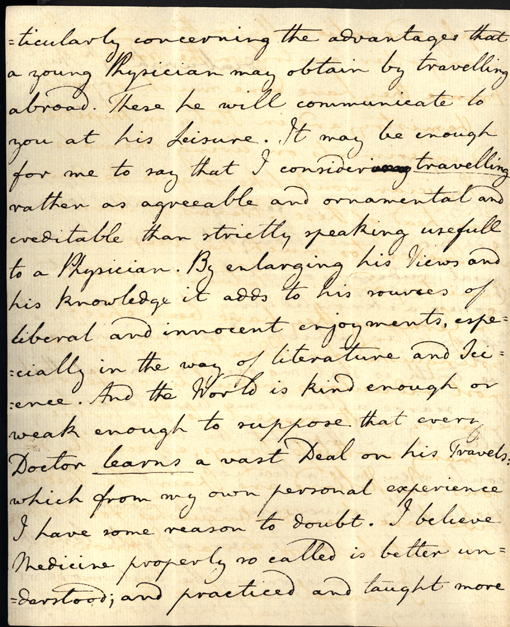 The truth is that my occupations at that time scarce allowed me time to write a letter, and I thought the best way I could shew my attention to yours was frequently conversing with your Son and explaining to him at full length my Notions concerning the best mode of conducting a Medical Education, and particularly concerning the advantages that a young Physician may obtain by travelling abroad. These he will communicate to you at his Leisure. It may be enough for me to say that I consider travelling rather as agreeable and ornamental and creditable than strictly speaking usefull to a Physician. By enlarging his Views and his knowledge it adds to his sources of liberal and innocent enjoyments, especially in the way of literaure and Science. And the World is kind enough or weak enough to suppose that every Doctor learns a vast Deal on his Travels which from my own personal experience I have some reason to doubt. I believe Medicine properly so called is better understood; and practiced and taught more simply and rationally; in this Island than in any other Country in the World. In France they have done much of late in Chemistry, and in Italy in Physiology and experiments on living Animals: A Physician would like to go to the Fountain head of these Streams of Science. In Sweden too much has been done in Chemistry and in Natural history. In Germany they have been chiefly distinguished for Pedantry, and for the most ridiculous Credulity or the vilest knavery with respect to the Virtues of many worthless Drugs, especially Poisons. In Holland and Spain the Medical tribe have been distinguished for Nothing of late; at least so far as I know. I cannot conclude this letter without assuring you that during your Son’s residence here his Conduct both as a Gentleman and a Student has been in every respect what you would have wished. 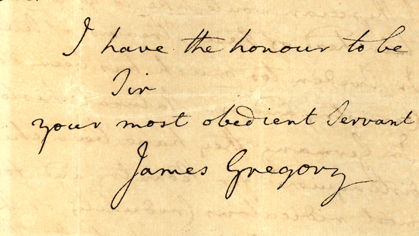 James Gregory was born in 1753 and died in 1821. His father, John Gregory, was Professor of the Practice of Medicine in Edinburgh and his son eventually succeeded him. As a professor James Gregory concentrated on teaching; he was also a Latin scholar of some note and his Philosophical and Literary Essays did not pass unnoticed. During his career he was involved on several occasions in severe controversies with different people with whom he disagreed, which led to him being suspended by the Edinburgh College of Physicians for defamation. Dissertatio medica inauguralis de morbis cœli mutatione medendis, Edinburgi, 1774. Conspectus medicinæ theoreticæ, 2 pt. Edinburgi, 1780[-82]. Philosophical and Literary Essays, 2 vols. Edinburgh, 1792. Epigrams and Poems, Edinburgh, 1810. Narrative of the conduct of Dr. J. Gregory, towards the Royal College of Physicians of Edinburgh. Drawn up and published by order of the College, etc., Edinburgh, 1809. Bell, John, Letters on Professional Character and Manners: on the education of a surgeon and the duties and qualifications of a physician, addressed to J. Gregory, etc. 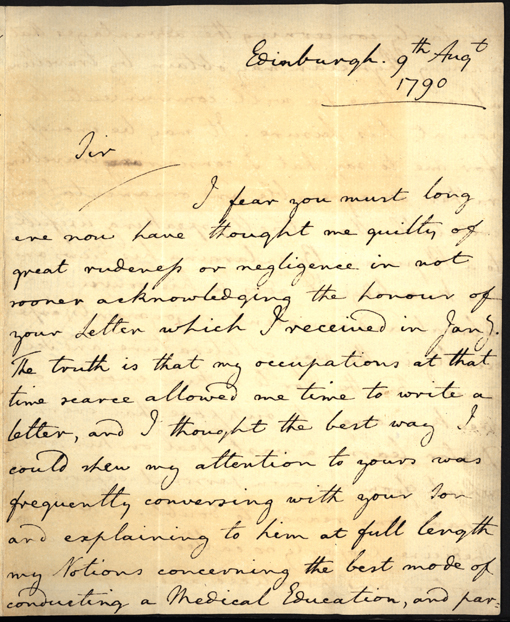 [A reply to the attacks of Dr. Gregory upon the Edinburgh College of Physicians], etc., Edinburgh, 1810. Detta inlägg har tidigare publicerats på Uppsala universitetsbiblioteks webbplats 2014 / This post has previously been published on the Uppsala University Library’s website 2014.